The BYU (Brigham Young University) researchers analyzed data from more than 8,000 families and found that babies predominantly fed formula were 2.5 times more likely to become obese toddlers than babies who were breastfed for the first six months. When a child is full and pushes away, stop! Don’t encourage them to finish the whole bottle. Putting babies to bed with a bottle increased the risk of childhood obesity by 36 percent. Introducing solid foods too soon – before four months of age – increased a child’s risk of obesity by 40 percent. Adding cereal or sweeteners to infant’s bottle at an early age, even before feeding cereal with a spoon. Higher protein content of infant formula is associated with higher weight in the first 2 years of life but has no effect on length. Lower protein intake in infancy might diminish the later risk of overweight and obesity. Mothers who follow a vegan diet should breastfeed their infants for as long as possible, 2 years or more is desirable. 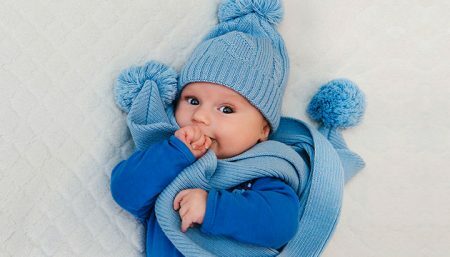 For infants being fed a vegan diet who are not breastfed or are partially breastfed, a commercial soy-based infant formula during the first 2 years of life is recommended. Breastfed babies usually require feeding every 1 – 3 hours. Formula-fed babies usually require feeding about every 2 – 4 hours. 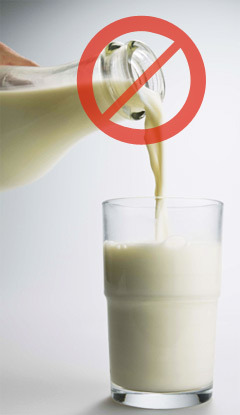 Do not give whole cow’s milk to your baby until the age of 1 year. Babies under age 1 have a difficult time digesting cow’s milk. Do not feed babies younger than 4 months any solid food, since they do not have the ability to digest it. At 4 months, or when your health care provider recommends, you can start your baby on pureed, strained, or finely mashed foods. As an infant reaches 4 – 6 months of age, nutrient needs become greater than human milk or formula can provide. Supplemental food need to be introduced to satisfy your infant’s appetite and for growth. Between 6 and 7 months, you can introduce crackers, vegetables, and fruit. 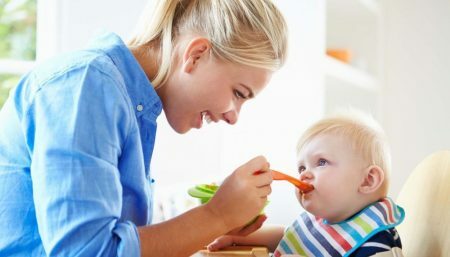 Commercial infant rice cereal is generally recommended as an infant’s first food, as it is easy to digest, high in iron and an unlikely allergen. Between 9 and 12 months, commercially prepared junior foods or chopped table foods are allowed. Always watch a young child while he or she is eating. Insist that the child sit down to eat or drink. Unpasteurised milk should not be used. Soy (except soy follow-on formula) and other nutritionally incomplete plant-based milks (e.g. rice, oat, coconut or almond milk) are inappropriate alternatives to breast milk or formula in the first 12 months. Do not offer infants tea, herbal teas, coffee or sugar-sweetened drinks (soft drinks, cordials). Infants and young children shouldn’t eat hot dogs, nuts, seeds, round candies, popcorn, hard, raw fruits and vegetables, grapes, or peanut butter. These foods aren’t safe and may cause your child to choke. Many doctors suggest these foods be saved until after your child is age 3 or 4. The AAP recommends not giving fruit juices to infants younger than age 6 months. Only pasteurized, 100 percent fruit juices (without added sugar) may be given to older infants and children, and should be limited to 4 to 6 ounces a day. Dilute the juice with water and offer it in a cup with a meal.